Mimi another word for Love...perfect little shelf sitter for displaying on a shelf or table. This little sign is made from wood and burlap. The wood on the sign pictured above is painted turquoise. The wood is distressed and stained. 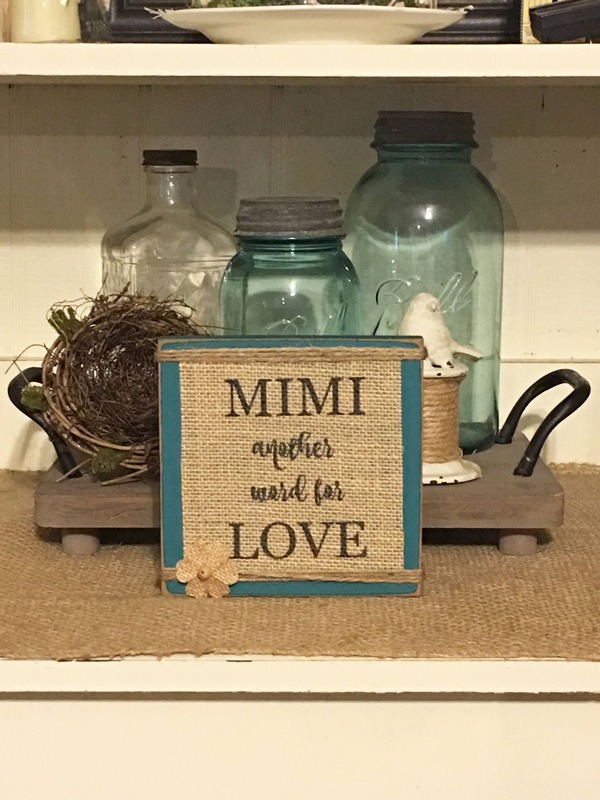 The Mimi quoted is printed onto burlap and attached to the front of the sign with a strong adhesive. The back of the sign is finished in black. The wood on this sign is available in other colors, please choose color when placing order. Also, if you need your sign printed with another name that is not listed please feel free to contact me and I'll see what I can do. Handcrafted by Daisy Patch Primitives. Sign is made upon receipt of order...please allow 1-2 weeks for delivery. Item shipped and was received in time for Mother’s Day! It was perfect for my mom , she loved it and I loved that she was happy. I accept credit cards through Etsy's Direct Checkout and I also accept payment through Paypal. Money orders are also accepted...must be received within one week after placing order. If your item is already made, I will mail your item within 1-3 business days. If your item needs to be made it usually takes 2 weeks for me to complete your order. During special holidays...Mother's Day, Father's Day, Halloween or Christmas deliveries will vary and may take 2-3 weeks...I am very busy during the holidays and work as fast as I can to complete your order. I mail all packages thru the USPS as "Priority" package. I do not charge any handling fees. Shipping costs are based on zipcode, weight and box size. Delivery will take 3 business days once your order is completed and scheduled for delivery. Delivery conformation is provided and your package will be insured. COMBINED SHIPPING: I am always happy to combing the shipping for you! If you are purchasing more than one sign I will combine the shipping. Once I have your order completed and marked as shipped I will refund any shipping overages. Please Note: I only ship within the United States. Also, once your package leaves my home I can not be responsible for your package. If your package is lost or damaged (your package is insured) you will need to file a claim with your local post office. Also, I am not responsible for packages that are stolen from doors, porches etc. Once the post office shows your package delivered, than we have no recourse. The Post Office does not pay insurance claims on packages that show delivered but then have been stolen after delivery.